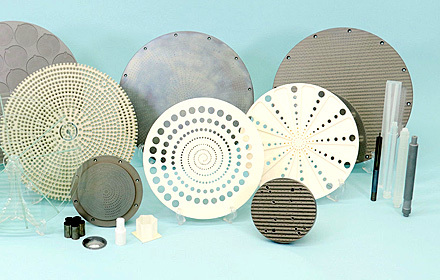 Support for Product Development |Precision Machining of Ceramics, Quartz, Tungsten & Molybdenum | Top Seiko Co,. Ltd.
With our latest machines,various kinds of machining tools in stock, and experienced engineers and machine operators,we help our customers to start their product development projects as quickly as possible. You can count on us for your low-volume prototype machining and high-volume production machining needs. For your challenging machining needs, we carry out test machining. Based on the results of the test, we decide the best machining conditions to meet and exceed your toughest requirements. We even carry out tests until desirable results come out. Take advantage of the combined strength of our material knowledge and machining know-how, and bring your exciting innovative products to commercial reality in a timely manner! You can take full advantage of our service by telling us your application of the machined part as specific as possible. We will help you find the best possible solution for your unique application through our deep knowledge of exotic hard materials and extensive machining experience. We can help you select a material with the right properties for your application. 1.Quality (including dimensional tolerances, complexity of shape, surface finish) and Quantity requirements, as well as Machining Cost. 2.Physical properties of the material including hardness, toughness, stiffness (Young’s modulus), thermal expansion coefficient, thermal conductivity, and electrical characteristics. 3.Chemical composition of the material. We will happily accept your orders once you find our service beneficial to you. We want to ensure our service is best suited for your machining needs. In case your requirements involve a special process or treatment which we do not handle, we are happy to introduce you to other machining specialist. After receiving the contact details from us, you can contact them directly. In case test machining is needed, we will decide machining process(es), machining equipment, machining tools, and machining conditions based on the part’s specifications and application requirements. We have a wide variety of machining tools in stock. For test machining, testing with tools in stock is recommended for quicker result and lower cost. Out of various types of machines, we choose the most efficient machine to carry out the test machining in a timely manner. Our experienced machine operator will monitor the machine during operation in order to detect problems and sounds such as those made by excessive machining loads or vibrations. Once detected, adjustments will be made to ensure optimum running. We evaluate the results of the test machining. If the results are not satisfying, we will continue testing until desired results are achieved. Then, we will finalize machining process(es), tools and conditions to proceed with the product machining. If this project requires specifically designed tools and jigs/fixtures, they will be prepared at this stage. Final adjustments will be made to ensure all machining processes are carried out under optimal conditions. For each project, machines and operators are carefully chosen to make sure we can meet and exceed your requirements. You can even observe the machining operations as needed. Please be sure to make a reservation prior to your visit. All products go through inspection to ensure that we provide only the ones which fulfill quality requirements. All products are delivered with inspection reports. Information on manufacturing processes can be provided upon your request.